The Jagdtaschenmesser PUMA Folding Hunter was specifically designed for hunters. The Jagdtaschenmesser PUMA Folding hunter was designed in cooperation with Oberforstmeister Frevert, a prominent German hunter. 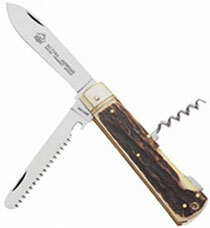 Do you prefer to carry a folding knife while hunting or camping? If so, you might find that the simple, rugged features of the Jagdtaschenmesser suit your needs perfectly. These are versatile, easy to carry German knives that combine the beauty of traditional stag with the practical functions of multiple blades and tools of Solingen steel. The Jagdtaschenmesser 3-tlg weighs 171 g, and is 11.5 centimeters in length closed. The main blade is Solingen stainless, and is 8.5 centimeters long. A leather belt sheath is provided. The Jagdtaschenmesser 4-tlg weighs 225 g, and is 11.5 centimeters in length closed. There is a blunt tipped skinning blade, a saw blade, and a corkscrew. The main blade can make the starting cuts, and the blunt tipped blade can zip the cuts along without the point penetrating what's underneath. These blades can be used to dress out your game as needed, and the saw can cut through bone. The corkscrew, of course, is to open the wine for the evening meal. 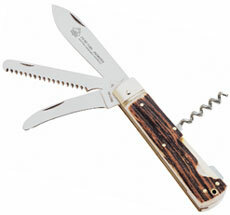 Imagine how helpful the Jagdtaschenmesser PUMA folding hunter could be with your other hunting and camping chores. Return from PUMA Folding Hunter to the German Knife .com home page.